A Shroud of Thoughts: Richard Griffiths R.I.P. Richard Griffiths, who played Uncle Monty in Withnail & I and Vernon Dursley in the "Harry Potter" films, died 28 March 2013 at the age of 65. The cause was complications following heart surgery. Richard Griffiths was born in Thornaby-on-Tees, North Yorkshire on 31 July 1947. His parents were both deaf and as a result Mr. Griffiths learned sign language while very young. He grew up in poverty. While he would become known for his girth as an actor, as a child he was underweight to the point that at age eight he was given treatment on his pituitary gland. As a result of the treatment he started to gain weight. He attended Our Lady & St Bede School in Stockton-on-Tees. He left school at age 15 in an attempt to find a job. Unable to find work, he attended classes at Stockton and Billingham College. It was when he was 17 that a teacher took him to see Edward Albee’s production of Who’s Afraid of Virginia Woolf. He was so impressed that he enrolled in a drama class at Northern College of Music in Manchester. It was while he was at university that he received his first major role, a part in a college production Arthur Miller’s The Crucible. He was spotted by Sir Trevor Nunn, then artistic director of the Royal Shakespeare Company, and as a result joined the company. His television debut came in 1974, in a guest appearance on the show Crown Court. In the Seventies he guest starred on such shows as Village Hall, When the Boat Comes In, Red Letter Day, The Expert, Second City Firsts, ITV Playhouse, and The Sweeney. He made his film debut in 1977 in It Shouldn't Happen to a Vet. He also appeared in Breaking Glass (1980) and Superman II (1980). In the Eighties he starred in the television shows Bird of Prey and A Kind of Living. He guest starred on the shows Minder, Whoops Apocalypse, Five-Minute Films, Boon, and The Marksman. In 1981 he was considered to replace Tom Baker in the role of The Doctor on Doctor Who, but was unavailable to take the part. He appeared in the films Chariots of Fire (1981), The French Lieutenant's Woman (1981), Ragtime (1981), Britannia Hospital (1982), Gandhi (1982), Gorky Park (1983), Greystoke: The Legend of Tarzan, Lord of the Apes (1984), Shanghai Surprise (1986), and Withnail & I (1987). He also provided the voice of Slartibartfast in radio adaptations of "The Hitchhiker's Guide to the Galaxy" series. In the Nineties he starred in the television series Pie in the Sky. He guest starred in such shows as Perfect Scoundrels, El C.I.D., The Good Guys (not to be confused with the American series of the same name), Inspector Morse, Lovejoy, The World of Peter Rabbit and Friends, In the Red, The Canterbury Tales, and The Vicar of Dibley. He also appeared in the mini-series Gormenghast. He appeared in the films The Naked Gun 2½: The Smell of Fear (1991), Blame It on the Bellboy (1992), Guarding Tess (1994), Funny Bones (1995), Sleepy Hollow (1999), and Vatel (2000). It was in 2001 that he first appeared as Uncle Vernon in Harry Potter and the Philosopher's Stone. He appeared in the role in another four films of the eight in the series. In the Naughts he also appeared in the films Stage Beauty (2004), Venus (2006), The History Boys (2006), and Bedtime Stories (2008),. He was the voice of Jetlz in The Hitchhiker's Guide to the Galaxy (2005). He also appeared on the television show tlc, and the miniseries Bleak House. In the Teens he appeared in the films Pirates of the Caribbean: On Stranger Tides (2011), Hugo (2011), and Private Peaceful (2012). 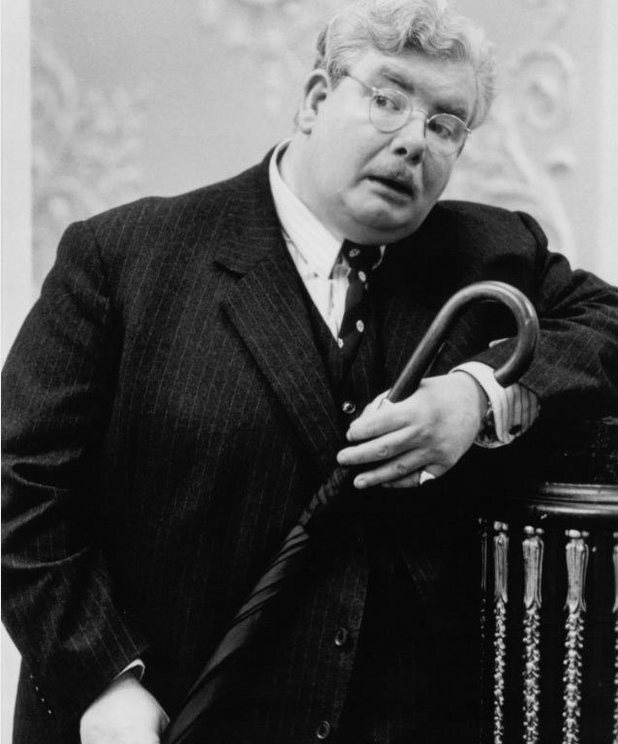 Richard Griffiths was a very talented and versatile actor, equally at home playing both drama and comedy. He was incredible as the flamboyant homosexual Monty in Withnail and I. At the same time he did well playing Anton in Gorky Park. While Mr. Griffiths was equally adept in comedy and drama, he was also versatile in the sorts of roles he could play. In The History Boys he played Hector, the popular General Studies teacher who fondles his students as he gives them rides home on his motorcycle. In Stage Beauty he played an entirely different role, that of the foppish and not particularly likeable Sir Charles Sedley. Richard Griffiths was an actor who could play both comedy and drama well, and one who could play a wide variety of roles. It is very sad that he died much too soon.